One of the problems with scientific research is the fact that retractions happen. They have been on the rise recently as well. There have been some high profile instances which have had some serious ramifications. one of these cases was in the prestigious Lancet from the UK and it involved a sample of 12 children and has caused the vaccine autism connection. 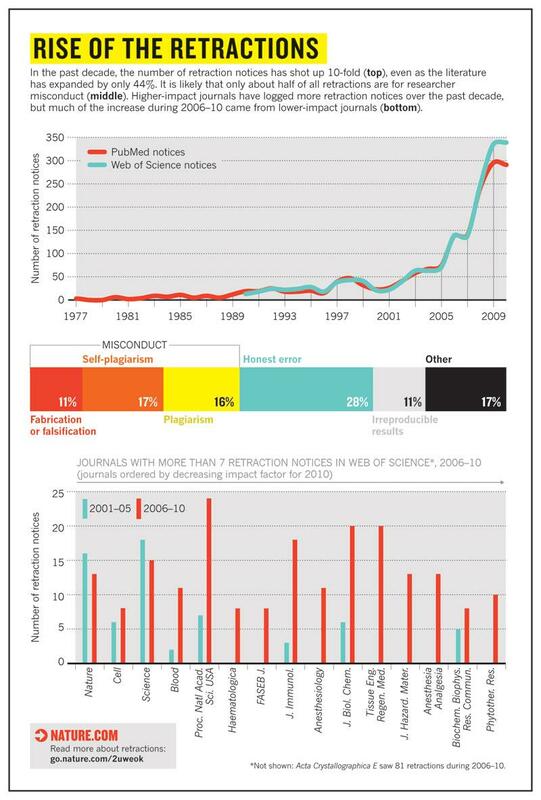 In the graph below is a break down of the reasons for retractions. We need to be aware that mistakes do happen, but real fraud is completely unacceptable. Despite the fact that no science is frivolous, not all research is worthy of being published. There need to be scientific standards for quality work to be published. Without this standard, the respectability of science will go out the window. The only solution right now is peer review. Which involves a pair of credible scientists independently reviewing the same article. Between the two scientists they are expected to find fraud, mistakes, biases and ensure that the research really contributes in the manner the researcher(s) claims. These standards have additional impact. The number of papers published by a scientist can impact the location they work, the amount of money they get from grant organizations and credibility within the scientific community. These standards are the only thing that keeps science from turning into pseudo science like the anti-vac movement.